Participants: Shanti Provasoli (Prospective teacher), Vanessa Guerrero (Oakland High), Kristen Vetterlein (Grass Valley), Amber Miller (Chabot), Lisa Perkins (Edna Brewer), Crystal Barr (Urban Promise Academy), Deborah Gordon (Central Office), Jamie Treacy (Skyline), Ana Ponce (Skyline). School bling made out of cardboard. Necklace made with school mascot and beads. Much of their art projects are made on copy paper and found paper. First few years at McClymonds, Rosemary made many of her projects with cardboard. Student work and Project idea: Students create shapes from found card stock and then create crayon rubbings from their collage. To add another dimension of texture to their work, students go around campus and take rubbings from a variety of surfaces on campus (a texture scavenger hunt). Directions: Find a black and white photo from a magazine, cut it in half and then extend the face into a drawing using the photo as a reference. Rosemary shared that students who feel they can’t draw have something to start with when using the magazine reference and are more likely to participate. Students repeat the process with the other side of the photo. On one drawing students try to draw their portrait as realistically as possible. On the second drawing, students draw their portrait with a fantasy style. Both drawings need a background. I’ve included lots of photos of student work to help illustrate the project’s process. 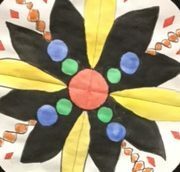 Students can incorporate texture rubbings, collage elements and even bas-relief elements like beads or rhinestones to make their work even more engaging. When students complete both sides of the portrait, you can display them as two pieces, or fuse both drawings together and take out the magazine portion.